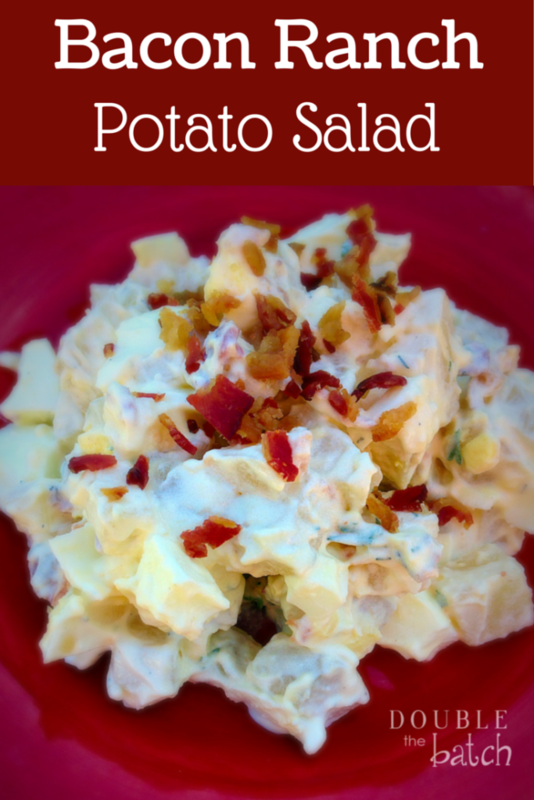 Here is the story of how I came to fall in love with Bacon Ranch Potato Salad. Once upon a time, I went to a neighborhood gathering and my lovely neighbor Josie brought an potato salad that looked good enough that I put it on my plate, even though I generally don’t enjoy potato salad. And do you know what made me give it a second look? Bacon. Because who can pass up bacon really, so I though I better give this thing a chance. And I am so glad I did because it was simply scrumptious and so I asked her for the recipe and of course she is kind of like me, “Well, I put a little of this and a little of that…” — no actual measurements of anything. 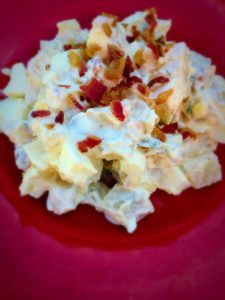 So, I messed around with this Bacon Ranch Potato Salad until I came up with a recipe for it that I could share. Try to dice your potatoes as uniformly as possible. And I think smaller is better. Then the sauce coats more of the potato and it is more flavorful. You can use any potato you prefer. I’ve used red and russets and both were great. Pour the chicken broth in your pot and bring it to a boil. Add your potatoes and cook them until they are just tender. DO NOT overcook them… or under cook them. Good potato salad depends on you cooking the potatoes just right. No pressure. But if you mess this part up, its over. 😉 Drain the potatoes and put them in the fridge or freezer to cool them faster. 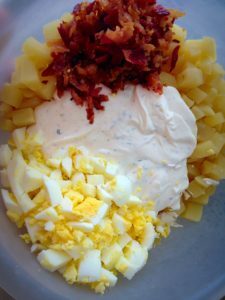 In a bowl, combine the sour cream, mayo, milk, vinegar, and all the spices. Taste it and adjust the flavor to your preference by adding more salt or onion or garlic. If you want to use a ranch seasoning packet instead of the homemade version, that will work fine as well, but mix it into the half mayo/half sour cream and 2 Tbsp. milk mixture. Once the potatoes have cooled, pour this mixture over them. Sliced up the hard-boiled eggs and bacon and add them to the bowl. Stir it all together until the potatoes are evenly coated, but try not to over stir it and make the eggs get all crumbly. Garnish with a few bacon crumbles on top and serve! For more delicious side dishes check out my round-up of the best side dishes out there here!